Birds scattered as the constant thunk-thud of her feet passed far below them, under the sweep of spiked branches and deep within the well of shadows on the earth. After a while Valka wondered if her steps spelled out some kind of pattern – a secret, unknown to her, but announcing bad news for all other life. She watched dark wings sweep across the sky and watched the sun fall slowly down. I am alone, she thought. The truth of it provoked a hollow feeling somewhere deep within the smooth cage of her ribs – not sadness, not quite, but… empty. Familiar. Valka paused the loud noise of her progress as the sun began its slow bleed into night: red fanning out behind the trees and spreading into purple at the very edges of the sky. Muffled heat soaked through the forest, fanned the hardened streaks of salt along her flanks. Her lungs sucked in air but the heave of her ribs proved brittle – uncomfortable. With an agitated flick of one ear, she recalled the lighter forest behind her and the chuckle of conversation. ”Why am I unlucky?” she inquired of no one in particular. Only the forest answered with its quiet shuffling of small feet and the unchecked spread of hungry shadows. Valka snorted, unimpressed, and flattened her ears at the dark. I am of blood bred from the wild lands like these, she told herself. I do not fear the dark, or loneliness, or anything… yet she shuddered when a crow quarked out hoarse warning just behind her. Perhaps that was the secret from which all the birds and squirrels fled: she was bad luck, made for one world and yet raised in quite another. She longed to rise on her hind legs and puncture the sky with that curl of horn on her brow, but the earth caged her down and history made her complacent. She had only the dream of great things – the noise of her feet in a dark place, the rush of her heart as she ran. Weary with more than just the strain of many days walking, she eased herself below the branches of a spreading pine and leaned her hip into its corrugated bark. Just above her head, a deep scar in the trunk warned of an unknown danger: big, old, likely past. Valka sniffed the bark in idle curiosity, filling her lungs with the acidic scent of pine resin. This place is old, she thought, and wondered how old – how many things had it seen? How many darknesses danced in its embrace every night? She ought to feel welcome within such a place, she told herself. Perhaps things like her would rise with the moon and laugh when they found their daughter here from so far away… Perhaps. In the fading heat, in this tired body, Valka found it difficult to believe much of anything. Perhaps a wolf would leap at her throat and she would die where she stood. It seemed just as likely. With a huff, she lowered her head and watched the sun set, watched the shadows grow, watched yet another strange land change around her without any notice of the unicorn it harbored. Snö was traveling far from home. With every step she took, she ventured towards the forest that drank in the sunlight and stubbornly refused to admit it. The sky was turning red, bloody red fading with indigo and deep blue, with the one star that glowed, the star of the North Snö had slowly had begun to enjoy, for all of its many faults. It was not the Edge- too many scents were new, and too many old were gone. Thais, the black Monster, with a horn through his heart; Lucius and Lloyd, the two brothers who had simply gone from sight; and Mauja had disappeared for much more than his due course of time; Crash Course, Crowley, and Chernobyl; too new. She missed the Edge, and she wished there was no need for secrecy of racism. The Plague deserved to be feared, for all its swift, cold, working under the cover of clouded nights. Snö was not an idiot, for all her vindictive faults- she understood how secrecy to lead to killing. But why must it be so agonizingly slow? Dammit all! Snö snorted as she moved, swinging her round hips and using everything she could to portray herself as gorgeous; for with her frost-coated horn and varnished body, she was beautiful, more than beautiful. She was like the North Star, or the moon, or a pearl. Again the young mare snorted, swishing her silky tail and bobbing her head in annoyance. Numbers. They needed numbers! Her father said they should only reserve judgement for the oldest and most important of members. Mauja could not be more idiotic in that manner. If someone was fool enough to tell everyone, the Plague could slaughter them, eradicate the threat of being exposed. And then the ones who were told. At that moment, Snö was plunged into the deep shadows of the darkest forest of them all, where her coat shone ever more and she moved with a grace unparalleled. It was not long before she heard the crackle of hooves snapping twigs and saw a glimpse of deep blue, with a flash of white. A curved horn, near touching the mare's ears, dark as shadow. For it was a mare, smelling of wilderness and something a touch like desperation. It was unicorn, a fellow, and she deserved not to look so down. Snö moved, light-footed but not entirely quiet, having no want to terrify the mare. Not quite was she in such a cruel mood. Not yet. "It's dangerous to be out in the wild alone. I am Snö, of a herd to the north." Tones frosted as always yet with a pinch of innocence that was a lie. Her innocence was stripped from when she was a foal, and in her first year alone she had plunged her horn through the heart of an equine. Something ghostly moved between the trees: a flash of white, the rustle of dry brush. Valka’s ears drew up, intrigued. She recognized the shape for horse this time. The flash of adrenaline that accompanied her meeting with Sulwyn was absent; instead the young mare lifted her head and blinked through the trees at the ethereal shape now approaching. Shafts of moonlight painted the stranger in a cold, pale light – but even through the shadows she glowed. Head up, muscles tense beneath the dirty edges of her coat, Valka stood and watched and waited. The stranger greeted her, but for a long time that greeting went unanswered. ”You have a horn,” she said at last, her voice hoarse with awe and disbelief. The sudden tension strung throughout her frame, the way the moonlight glinted in her eyes – it might be read as fear, but it was something else, some bud of hope now bursting into bloom. Valka leaned into a single, shivering forward step and hesitated. Her nostrils flared, sucking in the scent of frost and spice – a smell like winter, like that blowing snow on the day of her birth. ”You are a unicorn, like I am,” mumbled Valka. She wanted suddenly to run but knew not where; she drank in the sight of the stranger instead, her eyes hungry – fervent. You’re beautiful, she thought but didn’t say. The other mare was like a frosted heath, like something from a story: light, lovely, sweet, and yet tinged somehow with the hard glint of frost. Perhaps it was some edge to her voice; perhaps it was merely the way the mare held herself – a stance full of grace and wariness, of feral intelligence. Valka wanted all of it. ”S-Snö,” she fumbled, trying to remember what the unicorn had said. ”My name is Valka. I’ve been in search of others like myself for…ever.” She nodded. Her mind spilled suddenly, relentlessly, over the best ways to impress a stranger – but it moved so fast it tangled and she was left standing like a dumb girl yet again. ”Are there… others like us? In your herd?” She dared not even hope it, yet she longed to hear it: yes, you aren’t alone. And more than that, she longed to be welcomed and not threatened like some skulking dog. A herd in the north, she thought, envisioning a gathering of unicorns all thick with winter hair, their long manes whipping in the cold wind, horns glinting in a sudden flash of sunlight. Let it be true, let it be true. Surely this was more than some cruel dream. Snö, feminine, curved, elegant, allowed a faint, ethereal smile to slip across pale lips, moving her head just so that her throatlatch glowed faintly, the delicate curve long and smooth. This mare, even painted in the crimson garb of the setting of sun, was black as pitch, with a sparkling of white snow dusting over her lower belly; one horn, sharp and glittering ebony, curved over her right ear, so clearly missing a twin; the mare herself was leggy and lean, of a slightly lighter build than Snö's warmblood and Friesian mix; but what Snö noticed most was this mare's eyes, wide and bright, the left a warm cocoa and the right a moonlight gray. Her hopes were only solidified by the graceful, tall mare's next words, a rush of hope that seemed tangled by the inability to put them properly to the air. Valka, the Hanoverian named herself, a name Snö found herself quite liking. It had a good feel to it, and it suited the dark mare admirably, just as Snö fit so closely to the creamy cold mare of the North, who sought ice magic with a fervored passion. "Valka," Snö replied, trying to warm her voice. How did one go about 'recruiting' others? Did they intentionally make them sound more welcoming? The pale yearling found herself at a loss to the matter. "There are many unicorns. We are just one herd of them-" A lie, maybe, but soon it would be unicorns everywhere anyways, should the Plague succeed. "Tell me- why do you wander alone? I can take you with me. You can come, to my herd in the North." “Valka,” Snö repeated the name and on her lips it was almost majestic. Valka’s dark ears remained fixed forward, now drinking in every breath of reply Snö might utter. She sounded kind, thought the dark mare – kinder than any wild thing could be expected to behave. Snö was less like the wolf, less like the driving storm, and more like… something warm and alive. Valka studied the pristine horn that spiraled gracefully up from between Snö’s eyes. That looked cold, she thought, and yet far more lovely – more honed – than her own uneven horn. To be truthful, Valka suddenly felt dreadfully common; here she was no witch-daughter. Here she was merely another daughter, and though the other mare was smaller than herself this Snö looked strong, and oh-so-proud. Valka sucked in a small breath, an attempt at a sigh, and tried to keep her upright stance unwavering. Snö had been talking while Valka thought – talking about a herd of many unicorns! Of course they lived up in the north – they were creatures of wind and frost, cold and unforgiving. Excited, Valka stamped her forefeet. ”They would accept me?” she asked, eager to leave now and do no explaining. Mindful that she didn’t want to anger the other unicorn, though, Valka bit her tongue and settled just a bit. ”I… was not raised among our kind. I was raised by dull-witted horses of a herd far from here. I knew my kind was elsewhere, and that I did not belong with such ugly creatures, so I left. And now I have found you!” Pride sang in her voice, and glee. She was quite prepared to run north at a hard gallop until she found them – this herd of Snö’s. Her crystal eyes, so glacial cold, held a slightly fire in them, a blue fire but a spark nonetheless, finding herself warming to this dark, attractive mare. Perhaps she was simply in a most excellent mood without having to deal with Crash Course, the cold little stallion, thinking himself so darling amongst the vicious and pitiless horses of the far northern land in the mountains frozen. He was less important than the lowest member of the Plague, even if he was of a higher status wearing the unicorn's crown upon his dark forehead. Yet Valka, this lovely mare, was respectful and proud of her heritage and her friends. Yet what Snö had not been expecting was the little mare to prance forward, stamp a hoof before quickly backing off. The cold ice princess blinked, mildly surprised at her behavior, and allowed a thin smile to wash over her pale lips, fluttering her long, lush white lashes. "Oh Valka. We would be honoured to have another join our ranks. We accept only unicorns, and of course they'll accept you!" Snö exclaimed, stepping forward, and her coat of pearl turned to blood in the red setting sun, an unknown representation of the bloodthirsty unicorns hidden within the Aurora Basin. Her eyes, so cool, softened slightly. To grow up around hideous horses your entire life? She could not imagine... "I'm so sorry, friend. Do you enjoy the company of unicorns only? Was it... difficult to grow around such bare-headed creatures? I cannot imagine... I detest them. I am so sorry for you, Valka. But you will be among friends should you wish." Valka forced her limbs to still when Snö responded. Honored; they would be honored! The dark mare bobbed her head. Both strange eyes remained fixed on her conversation partner, though. Crimson light washed over Snö when she stepped into the light; Valka marveled in silence, wondering how she could ever compare with a creature so regal – so lovely and kind. 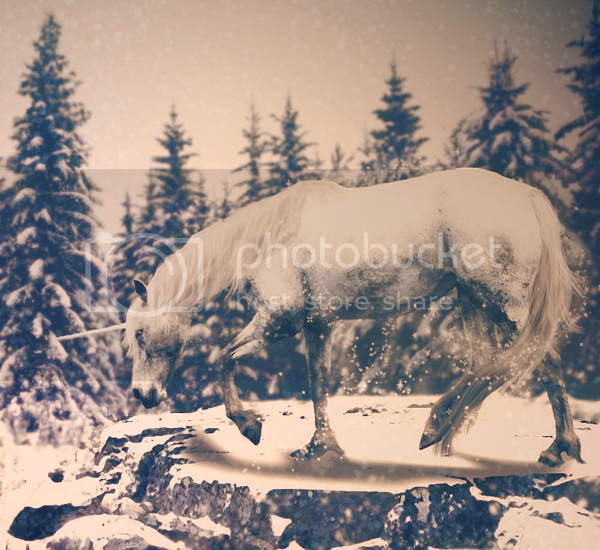 Snö was everything a unicorn should be; everything Valka had quite imagined. In the dusk they were both lit by the sun’s dying flames, but Snö glittered. And she called Valka ‘friend’ when next she spoke! Snö's smile widened, ever so slightly feral around the edges, if one was to look closely. The company of the sooty mare was most enjoyable- and she was well aware of the superiority of her species, something Snö took great care in noticing. Valka deserved much respect for being aware of her lineage and heritage as unicorn even for being raised around disgusting scum, the rats that swam in the sewer as opposed to the white hart of the deep forests. In fact, it was remarkable. Few she had met that had been raised in such poor conditions, dirtied by the mark of equines, had come out with their heads held high and their knees snapping up. For that fact, Snö admired Valka's adamant belief in her purity. With all the patience she held in store, she listened. Rarely was her cold little heart twisted by pity, but in this case, it was. Having to fake courtesy and care for the hideous, grostesque creatures under their feet, would by no means be an easy task. Should she tell this mare of Bacchus, far off to the North, her slave? No... but Snö, for once, would be happy to fetch a slave, make the horse pay for all her old herd had put the fine unicorn through. That would be hilarious! To see him writhing in pain, shuddering and twitching, bleeding under the delicate, needle-pointed horn and smashing hooves. She could do the horn-work, with Valka's turned back horn. But Valka would be welcome to plan whatever she willed. "Come with me, Valka. Let me guide me to the Basin," Snö murmured, stepping forward to press her cream cheek to her charcoal. Rarely was the glacial princess caring- but this mare had suffered so much. After a brief moment, Snö stepped backed, turned and began to walk, knowing Valka would follow.